Reached the 'End' of the evening? 'Save' the leftover wine for later! Whether you're a computer geek, a wine connoisseur, or some freakishly brilliant combination of the two, these handy bottle stoppers will make a brilliant addition to your kitchen drawer. 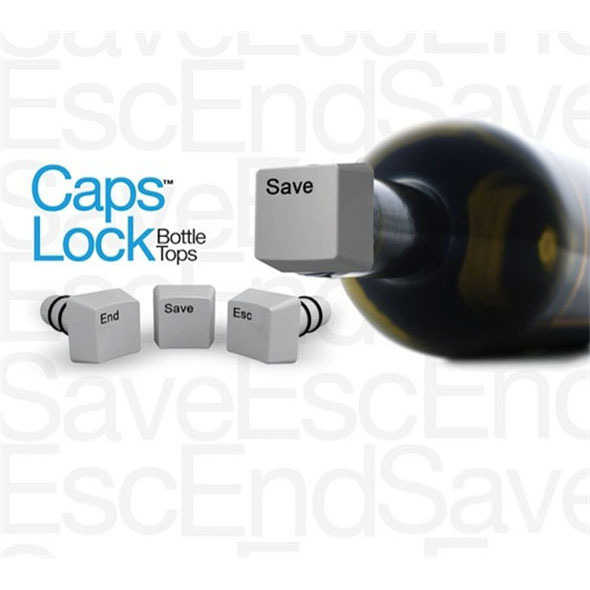 Designed to look like three different computer keys - 'Save', 'Esc' and 'End' - they're a nicely nerdy way of keeping your leftover wine fresh for whenever you next feel like a gulp or two. Great for saving leftover booze! Of course, they aren't really taken from a computer keyboard - they're made specifically to seal up your leftover plonk and keep it fresh for the next boozy gathering! Drink some of the wine, but don't finish the bottle! Since you can't force the cork back in, put one of the <strong>Caps Lock</strong> bottle stoppers in the neck of the bottle to seal it up.